Cox Automotive Helps Kids Fight Cancer | Cox Automotive Inc. Although September is National Childhood Cancer Awareness month, Cox Automotive’s commitment to cancer care is a year-round endeavor through its partnership with St. Jude Children's Research Hospital, the only comprehensive cancer center in the US devoted solely to children. September is National Childhood Cancer Awareness month, when Cox Automotive team members redouble their volunteer efforts to go the extra mile for children with cancer. For the last several years, Cox Automotive has partnered with St. Jude Children’s Research Hospital, the only comprehensive cancer center in the US devoted solely to children. 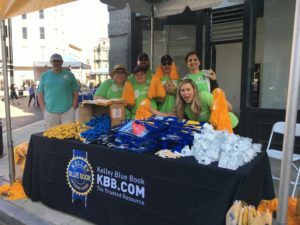 Cox Automotive’s Kelley Blue Book brand conducts a car donation promotion that runs on the kbb.com website from July through the end of September. For each car donated, the proceeds go to charity, plus Kelley Blue Book gives an additional $100 to St. Jude for each vehicle donated. Next, the Manheim brand procures the donated vehicles at its locations nationwide. The cars are processed and auctioned off, generating proceeds for charity, including St. Jude. Cox Automotive team members participating in the St. Jude’s Walk/Run to End Childhood Cancer occurring every September in cities across the country. Team members are the feet-on-the-ground for the St. Jude’s Walk/Run to End Childhood Cancer occurring every September in cities across the country. Employees and their departments form teams and recruit family and friends to lace up for the 5K event. Each participant collects funds in their community for the cause. Cox Automotive brands like Autotrader, NextGear Capital, and Manheim step up to sponsor the local run/walks in cities where they have a presence. In addition to a financial contribution, they host “spirit stations” manned by employee volunteers. “We hand out pompoms, bells, and get the crowd excited and ready to walk,” says Bronner. 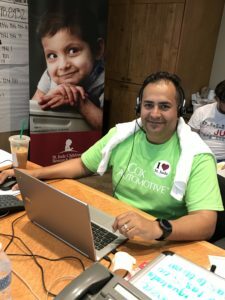 Other Cox Automotive team members raise money for St. Jude while training for marathons and triathlons. Designated as St. Jude Heroes, these hard-core fitness enthusiasts run in some of the most exclusive races in the country. St. Jude recently honored Cox Automotive hero teams training for the Pittsburgh Marathon. These dedicated employees have collectively raised $100,000 for the children’s cancer hospital over a three-year period. Cox Automotive’s commitment to cancer care extends beyond September. The company features free website display ads for St. Jude and St. Jude’s Dream Home Giveaway fundraisers. Through its “No Excuses” campaign of employee volunteerism, team members sit on committees that plan St. Jude gala affairs and other events nationwide. Cox Automotive employees also perform on-site projects at their workplaces, assembling kits for the hospital. In addition, team members teach one another to crochet, and then make beanie hats for St. Jude patients suffering hair loss from cancer treatment. impact on both patients and the company.